Motorola has already confirmed that it will launch new smartphones starting from April. However, as per a retailer, we might have to wait until May to see the Moto G6 devices launching. Earlier leaks hinted that the phones would go official on April 3 because of the same date on home screen widget of every Motorola device. The phones may be unveiled tomorrow itself, but the sale might not happen until May 2018. 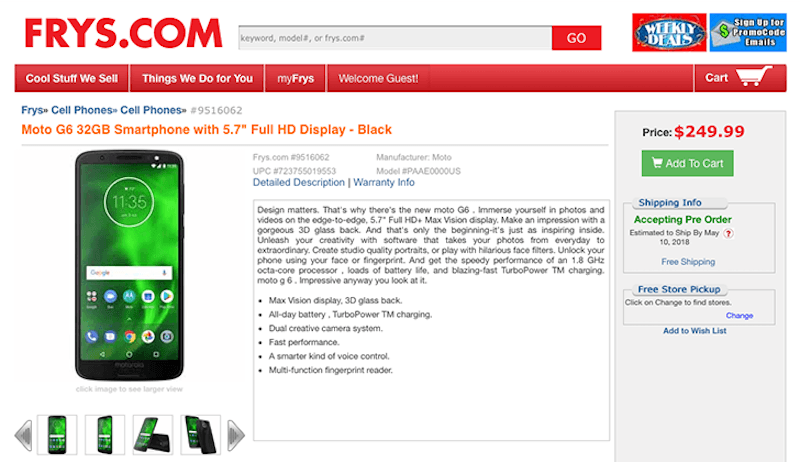 US Retailer Fry has now put up the listings of both Moto G6 and G6 Play along with the shipping date as May 2018. The listings are now pulled down, but not before the details are grabbed. As per the listing, the Moto G6 will arrive in 32GB/64GB variants and will sport a 5.7-inch display with a resolution of 1080 x 2160 pixels. Under the hood, the phone has an octa-core chipset, could be the Snapdragon 450 SoC. There will be a microSD card slot for storage expansion. The Moto G6 will pack dual cameras to the back and a wide-angle selfie camera. Also, it seems like the Moto Voice will support natural language detection this time around for taking commands even when the screen is off. A 3000mAh battery backs the entire smartphone, and the phone will offer Face Unlock feature too. Coming to the Moto G6 Play, it will have the same 5.7-inch display, but the resolution could be limited to just HD+. It’s powered by a quad-core chipset and will be backed by a beefy 4000mAh battery. The device will support up to 128GB capacity microSD cards. A single 13MP rapid-focus camera will be present to the back of the phone, followed by a 5MP selfie shooter. As per the listings, the Moto G6 will cost $249.99 (approx. Rs 16,286) and will start shipping from May 10. The Moto G6 Play will set you back by $199.99 (approx. Rs 13,029) and will reach consumers from May 17. Both the phones will ship with Android 8.0 Oreo out of the box. No one will buy this Motorola again in this era. because No VoLTE from airtel and vodafone + dont have CAT some varient. Product team must concentrate in that, otherwise it will effect in Production. Which CAT do you need in your smartphone? Non of CAT version is not supported their most phone of motorola. example my device Moto Z Play indian version which is not supported cat which is cost around 25k. but some base model (10k -15k) phones of moto have cat. that’s y i said moto should concentrate in their network side especially flagship models. other wise they effect huge production loss. @Sandeep bansal any questions now? What’s the meaning of CAT support? Do you mean CA- CARROER AGGREGATION…??? so you dont know what is CAT and purpose ?? CAT means Carrier Aggregation Technology, in India Airtel have CAT in kerala and other few circle and jio also have in few cities only not officaly launched, it will speed upto 135mbps. Motorola doesnt have that features in their Indian unit flagship models like Z play and Z2 play..and till yet no VoLTE from Airtel and Vodafone for Moto series. Did you bother reading my comment? Now for your satisfaction, here I am gonna put the last screenshot; It shows Cat4 Modem; which supports 4G but not 4G+/ LTE Advance/ Carrier Aggregation; It is Cat 4 modem; Now what will you call Cat in this??? HUH?? 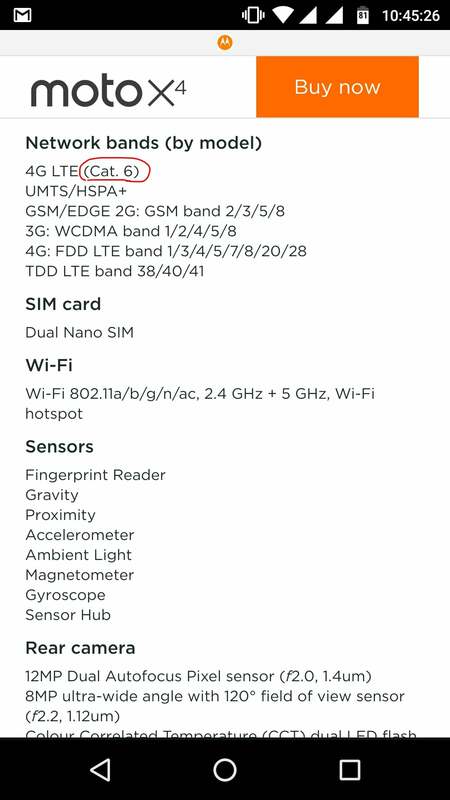 These devices will be launched with oneplus 7 not more then a difference of 15 days.